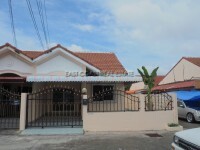 This house in East Pattaya is now available for sale and rent. This 2 bedroom property is on 24 wah of land, and comes fully furnished to a good standard. It has 2 bathrooms and a European kitchen, which is inclusive of all electrical appliances. The house is fully air-conditioned, with hot water in the kitchen and bathrooms. It also has a paid cable television service already installed and wifi internet connection. Additionally, there is an area for private parking at the front of the house. This property is available for rent on a long-term basis only, at a rate of 12,000thb per month. The house is also available for sale for 1,800,000thb. The title deeds to the property are held in Thai name and the tax and transfer costs are to be split 50/50 between the buyer and seller.